Gardening ‘To Do’ List in June After a Wet May! One of our worst lawn pests is mole crickets, they hatch in May, making June the best month of the year to treat your Bahia lawn. As you focus on your lawn, you can use sprays, baits, and granular controls. Remember to make sure your soil is moist before you apply them, and watch for chinch bugs, caterpillars, and other insects. Remember any fertilization which you did in February, March or April has washed away with the May heavy rains so it’s time to fertilize everything. You’ll want to remember to give that important second feeding to azaleas, camellias, ixoras, and gardenias. Be sure you use an acid-forming fertilizer heavy in essential minor elements. It’s also good for crape myrtle, crotons, dogwood, blue hydrangeas, magnolias, American holly, and podocarpus. Don’t forget to prune those azaleas! You can treat scale insects, spider mites, and white flies— which peak during the summer— with Malathion or Acephate. You also will need to continue feeding annuals and vegetables. Lastly, as you honor Dad for Father’s Day this month, why not help him with his lawn and garden needs? Help him knock out the to-do list this month, and if you have any questions, you can stop by Doty’s Farm and Garden Supply in Winter Haven. 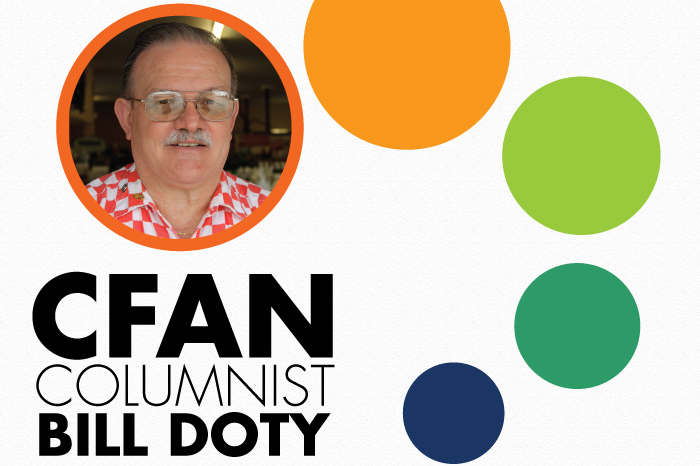 This column is sponsored by Doty’s Farm and Garden Supply. BIO: William R. (Bill) Doty, is the owner of Doty’s Farm and Garden Supply Inc. Founded in 1954, Doty Farm and Garden Supply, Inc. has been there for every one of their loyal customer’s budding needs. Bill graduated from Winter Haven High School and then Florida State University. Having learned invaluable lessons in listening, asking questions, and reading anything related to the family business, he shares his knowledge with his customers daily and our readers each month.